I have been pregnant eleven times. Every time I craved iced. Every time I gave birth I stopped craving ice. It is amazing how many doctors don’t know ice cravings are a symptom of anemia. My second daughter had five pregnancies. She also craved ice during each pregnancy. We joked about knowing where to get the chest ice in town– Sonic and Dairy Queen! A few years ago I started craving ice again. I was not pregnant but I knew it was anemia. My anemia was so serious I had to have iron infusions every few months. The anemia was affecting my heart seriously. For five years I went to a hematologist weekly because if my hemoglobin fell below 10 I would need to be admitted into the hospital for a blood transfusion (due to the heart problem). My hematologist was so used to me telling him when I was anemic, he stopped week blood test and let me just call him when I started craving ice. Iron-deficiency anemia is the most common type of anemia in the world, affecting mostly women, young children, and older people. It is estimated that 15 percent of menstruating women are affected. I get regular blood transfusions because of my anemia problem. I can always tell I need more blood from my cravings. Every time, without exception, my iron levels are normal the ice craving stop. I can’t even imagine why anyone would crave ice. But when I am anemic ice is my number one prority every day. It is amazing how much it influences my life– I become like a drug addict. Hunkering down under the covers chopping away on a cup of ice. Symptoms include: fatigue, shortness of breath, rapid heartbeat, irritability, dizziness, lightheadedness, poor concentration, restless legs, increased infections, chapped lips, and sometimes ice cravings. I’ve been pregnant nine times so I recognize the symptoms (I think most “quiver full” moms know this innately). I always know when my levels drop before the blood test reveals the amount because I start craving ice and naps. The difference in my energy levels is drastic. 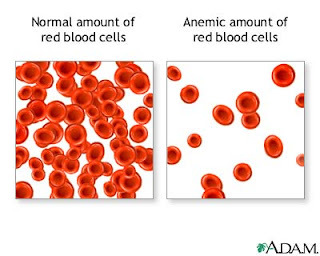 Any condition in which a person loses blood over a long period of time can cause iron-deficiency anemia. The most common cause in the USA is pregnancy and gastrointestinal bleeding. During pregnancy, a woman needs extra iron for her growing baby. My non-pregnancy anemia (stomach bleeding) is controlled by occasional blood transfusions, monthly infusions by an oncologist, and a daily prescription pill. However, most women do not require transfusions or infusions. Ice craving is a condition called pagophagia, or compulsive eating of ice. This is a form of pica, a condition in which people crave and eat non-food substances like ice, chalk, paper, laundry soap, starch, hair, dirt, clay, or paint. There are several reports linking the craving of ice to iron-deficiency anemia (low blood count as a result of an iron-deficiency). In fact, there’s even a website called “All About Chewing Ice,” which also has a support group for people with this condition. You can be anemic and not crave ice. If you are tired and craving ice, or your child craves ice add iron rich foods in your diet. See your doctor and ask for a blood test. Only take iron supplements under a doctor’s supervision. Overloading the body with iron can be dangerous. Humans have eaten earth, on purpose, for more than 2,300 years. They also crave starch, ice, chalk, and other unorthodox items of food. Some even claim they are addicted and “go crazy” without these items, but why? Sifting through extensive historical, ethnographic, and biomedical findings, Sera Young creates a portrait of pica, or nonfood cravings, from humans’ earliest ingestions to current trends and practices. In engaging detail, she describes the substances most frequently consumed and the many methods (including the Internet) used to obtain them. She reveals how pica is remarkably prevalent (it occurs in nearly every human culture and throughout the animal kingdom), identifies its most avid partakers (pregnant women and young children), and describes the potentially healthful and harmful effects. She evaluates the many hypotheses about the causes of pica, from the fantastical to the scientific, including hunger, nutritional deficiencies, and protective capacities. Never has a book examined pica so thoroughly or accessibly, merging absorbing history with intimate case studies to illuminate an enigmatic behavior deeply entwined with human biology and culture.